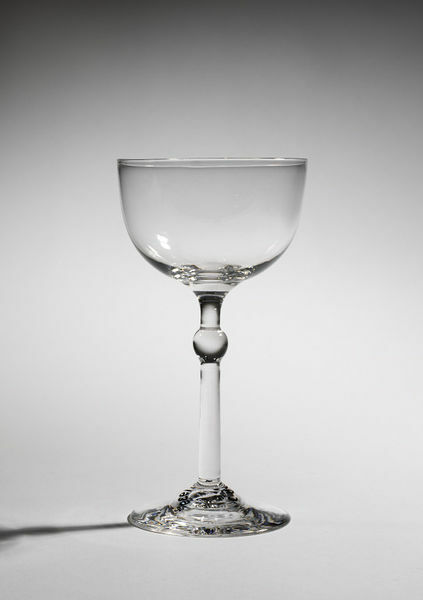 Although flutes were still made for drinking champagne, glasses with cup-shaped bowls were probably introduced around 1830 and were standard by the 1860s. 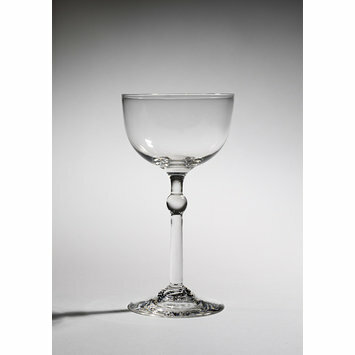 Among the glasses designed by Philip Webb there is also a champagne flute. By 1860, the architect Philip Webb (1831-1915) had designed an elaborately decorated range of glassware for William Morris's personal use at the Red House. These designs were subsequently simplified, probably by Webb, for commercial production by James Powell & Sons Glass Works. This glass is from that production. It was sold exclusively through Morris, Marshall, Faulkner & Co. and curiously, despite its importance in the firm's accounts, very little of the range survives. Against a small sketch of this shape, Philip Webb describes the glass as for champagne in the passbook in which he kept a record of his designs matched with prices. It is not clear exactly to what these relate but it has been suggested that '2 champagne 3/6d' may be Webb's account of two glasses taken from Morris & Co's stock in payment for his design work. The glass was bequeathed to the Museum by Morris's daughter, May Morris. Her continued occupation of the family home, Kelmscott Manor suggests that the glass may have been chosen by William Morris or his wife Jane.